"As a woman who has known complicated men her whole life, I can't help but wish The Male Brain had been around when I was a girl. 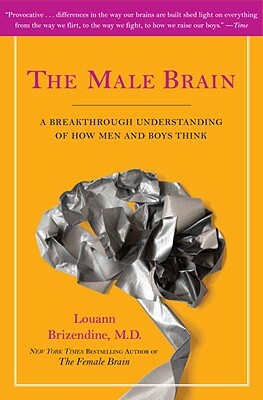 Dr. Louann Brizendine's lucid, lively, and always fascinating discussion of how the male brain works (and why) has enlightened me in more ways than I can count. Now I can't wait to give the book to all my women friends." "Dr. Brizendine has marshaled a host of impressive data and insights and presented them in an elegant and entertaining way to clearly illustrate men's reality--as infants, boys, teens, lovers, husbands, fathers and workers. It's a deep dive into the worlds of men, as well as a fascinating read. And along the way, you will pick up some valuable tips to help you understand, appreciate and connect with the men in your life." --Helen Fisher, Ph.D., author of Why Him? Why Her? "It takes an extraordinary woman like Dr. Louann Brizendine to understand the male brain. She brings the latest in state-of-the-art science in helping us to understand the most ancient and primal of male passions and desires--and viva le difference! Highly recommended." "The remarkable brain science behind Mars and Venus in a really enjoyable read! I think that this book, along with The Female Brain should be read by every parent, child, husband, wife, employer, employee, and dating age adult – they bring love and understanding into our most important, and sometimes most frustrating relationships."